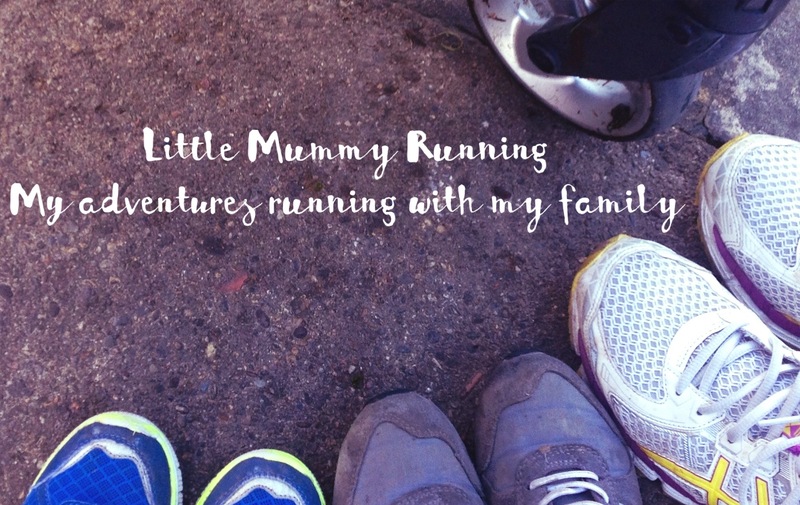 On 24th October 2015, I bought the domain name littlemummyrunning.co.uk. I had a three month old baby and I was running myself ragged trying to be on time for three school runs a day. My timing possibly wasn’t great. But looking back now, on my anniversary, I can now see that my timing was perfect. This is what I love about my blog. During my previous two periods of maternity leave I found myself, at times, mind numbingly bored with being at home. I often found myself locked in games of spider solitaire on the iPad or sudoku in the local paper. Totally desperate to use my brain. I have always had a head full of stories and a desire to make people happy. So why not share a bit of it with the world. Writing the blog gave me a direction. Setting and meeting my own deadlines. It gave me part of me back in a world of nappies, snotty noses, tantrums and breastfeeds. It helped me to find the humour in some of the worst days and celebrate the days when it just went amazingly well. I have never been a good runner but I have always returned to it as a means of staying sane. The times that I have struggled with parenting it has always saved me. Even if the run has been no more than a slow plod. With the arrival of Little Miss, I knew my opportunities to run were going to be limited. The blog gave me an outlet to share my plans, hopes and dreams about catching a small piece of freedom. In turn it kept me trying even when it was the last thing I wanted to do. I foolishly thought that once the blog was set up, I could just write and it would just work. I was very very wrong. There are all sorts of things to learn about. SEO, analytics, meta keywords, widgets, data, codes, etcetra, etcetera. I was lost. On one occasion I lost my whole blog by just adding a space where there shouldn’t be one! Luckily, I know a lovely blogger who saved my life and blog more than once (thank you Ordinary Cycling Girl). She patiently answered my questions and often took the time to explain things in simple terms. Often more than once. With her help and that of my part time running buddy Rachael, I can now confidently navigate my way around the technical stuff. It isn’t perfect and I am still learning, but I’m proud of how far I’ve come. My blog gave me confidence in many different ways. The confidence to run and to write but also to parent better. Putting my thoughts in one place, telling my stories and gaining positive feedback encouraged me to do better. Not to be perfect just to find a happy place and enjoy the crazy monkey roller coaster. Through blogging link ups I have become part of a community of bloggers who share and promote each other’s work. I have been lucky enough to be featured post more than once and I have had some amazing comments from people I have never met. In my none virtual life I have made new friends running too. Good solid friendships with people who I can rely on during the 3am breastfeed to be available for support. Opening up online brought likeminded mummies to me in the school playground too. Some that I might not have sparked friendships with because I was intimidated by the illusion they were better at this than me. As it happened we are all the same really. Just doing our best to be the best we can be. Some of my favourite posts have brought with them support and praise. Coffee, Cake and Cuddles, Conquering Laundry Mountain, Solomon’s Monster Truck, It started with a Sandwich, and There’s Half a Plastic Chicken in my Designer Handbag. Positive comments and numerous shares on social media. My following may be small compared to most other bloggers but, I can’t help but feel a little thrill when my realtime analytics tells me someone out there is reading my blog. I especially love it when I see it is in a location where I don’t know anyone. Strangers reading my words and hopefully enjoying them. More than one is even better. On one occasion I nearly fell off my chair when I saw 24 hits all at once. I later realised that I had just been spammed. Still it was exciting for a moment at least. So happy Anniversary Little Mummy Running. Sadly since my return to work it is getting harder to write as much. The task of writing, editing and publishing takes time, energy and brain cells all in dwindling amounts at the moment. What I do know however is I cannot let my little blog fall into the internet graveyard of forgotten and neglected blogs. It means too much to me. In my first ever post about why I wanted to do this I wrote about watching Top Monkey riding his bike for the first time. My desire to feel that freedom and be as close as I can to flying. One year later, Middle Monkey is now riding his bike too. Tentatively pushing the boundaries every time we go out. 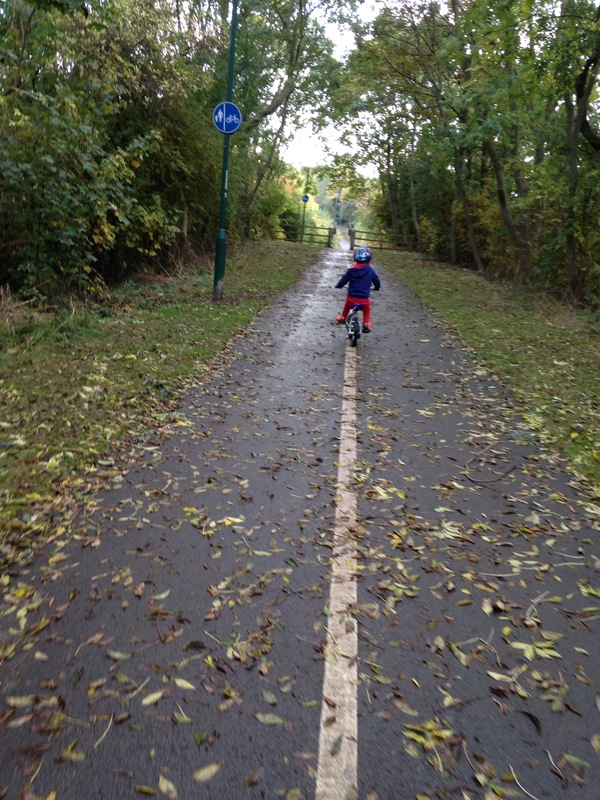 On Saturday morning I had a rare trip out alone with Middle Monkey and we walked/biked to his football session. It had been a long week. I was tired and stressed, but stepping out into the autumn leaves, watching Middle peddle his little bike, stopping every so often to see if I was still watching. It inspired me to keep going. Things may seem quiet right now thanks to monkeys with broken bones, vomiting virus’ and teething troubles. I admit that I have been struggling, but my little walk with Middle Monkey helped me refocus my mind. A trip back over the last year of writing reminded me of my best pieces of advice. Keep it simple, slow things down and take it one step at a time. I will continue to write and edit and publish and admin and link up and share. I will continue to write. So stick with me because once the monkeys get bigger and need me a little less, who knows where this could take me. It has already handed me some of my dreams. Here’s to many more anniversary celebrations in years to come. A year ago I barely knew you. Today life wouldn’t be the same without you! Lots of love from your friend who will always be here (especially at 3am). Happy 1 year anniversary! A year already?! How time flies! You have achieved so much with your blog in a such short blogging space of time. Congratulations on your one year anniversary! It was a pleasure helping you set up your blog and even more of a pleasure watching it grow. You have created such a supportive and inspirational corner of the internet. Keep up the good work! Such a lovely post, I hope the return to work is going well and that you find time. I am forever playing with time saving ideas and plans to simplify blogging. It always seems to take an age to do a post whatever I try, yet I can do a long and eloquent instagram in minutes sometimes! Happy Anniversary, I’m glad your blog has helped so much. Does’t time fly? Happy Anniversary! I have gained so much through blogging too. Cass Bailey recently posted…How to clean your house FAST….